Author and illustrator of the Penguin children’s books, Dog Blue and Flyaway Katie, Polly thinks that colour is a brilliant way to cheer yourself up and whenever she’s feeling grey, she puts on her best pink frock and paints! She started writing and illustrating at age 16, when she published two books – which she describes as “cartoon books inspired by teenage antics”. Dunbar was born in the Cotswolds and moved to Stratford upon Avon when she was very young. She went to school there until she was eleven and moved to Norwich with her family. There she attended City of Norwich School and Norwich University College of the Arts. She graduated in 1999 with a degree in illustration from Brighton University. 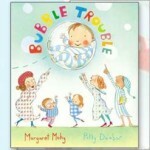 Polly is the daughter of the distinguished author Joyce Dunbar who she collaborated with on the picture book Shoe Baby. She is also the illustrator of My Dad’s a Birdman, written by David Almond, and Here’s a Little Poem, an anthology of poems for very young children. 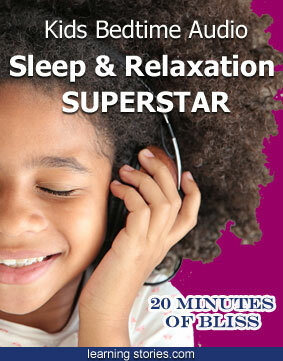 She was named “Most promising new illustrator” in Publisher Weekly’s Cuffie Awards in 2004. 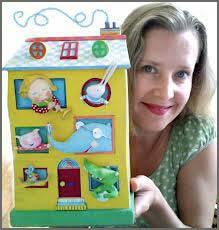 In 2008, she is featured in The Times’ list of “The best new picture book illustrators”. Polly Dunbar lives and works in Brighton, England. You can find out more about Polly Dunbar at this link on Wikipedia. Polly’s Other Books Are Available at the links below.